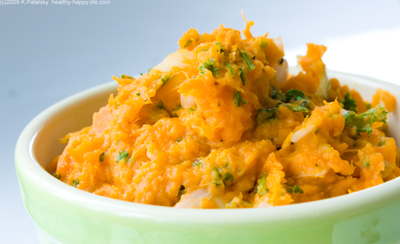 Kathy's Famous Sweet Potato Mash! 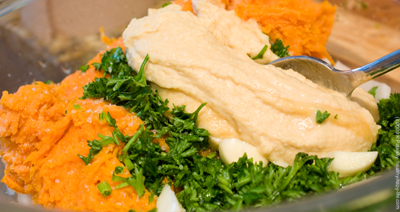 This is my delicious recipe for Sweet Potato Mash. This recipe takes a simple baked sweet potato and turns it into an incredibly versatile and flavor-packed ingredient, side dish or condiment. My flavors? Parsley, Garlic hummus, vidalia onion, and citrus. Accents include maple syrup, lemon, cayenne and a nice amount of fresh black pepper. Savory-sweet heaven. How do you use it? I put my mash on sandwiches, burgers, pizza, toast or mixed into grain or pasta dishes. Or just eat it plain. I even put it in burritos and enchiladas. Black beans, Chile's and sweet potatoes are a great combo. But before I scare you off by my eat-on-anything love of sweet potatoes, check out the recipe. It is easy to learn and easy to modify based on your own tastes. Once you make it your own to sweet potato perfection, use it in recipes, or leave it be for a killer sweet potato side dish. 2. Mash well. But don't over-mash! A thick chunky texture is perfection. 3. Fold in carrots and any add-in ingredients. Creativity is encouraged! 4. Garnish with fresh chopped parsley. 5. Serve warm-hot or reheat in microwave or on stove top. Read all about Sweet Potato Nutrition Facts and Super Food properties here.